Japan, Taisho Era (1912-1926) – A young priest-in-training named Nakahito Kagura stumbles upon a secret laboratory owned by a scientist named Ayanokouji. There, he discovers Kurumi—a Steel Angel originally designed for advanced military combat. Their lips accidentally meet when an attack by the imperial army rocks the facilities. As a result, the kiss awakens Kurumi, who sees Nakahito as her only master. But with the army on their tail and Kurumi's "sisters" Saki and Karinka awakened, Nakahito, Kurumi and Professor Ayanokouji must run for their lives while trying to find out the truth about the Angel Heart—the source of the Steel Angel's power. Koutetsu Tenshi Kurumi started its serialization in Ace Dash, but after being discontinued after only 7 issues, the series moved to the newly created Ace Next and featured the magazine until the last nineteen chapters, which were published in Shounen Ace. 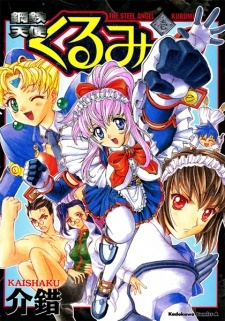 The series had nine volumes published in English as Steel Angel Kurumi by ADV Manga from December 29, 2003 to December 7, 2004, before the license was dropped and the publisher went defunct.